Thanks to everyone who has joined us on the New Zealand Babywearing Week Facebook page as we count down to October 6th. To celebrate 1600 page members we have a Banz Sun-Safe Kit thanks to Banz NZ to give away to one lucky page member! Included in the pack is a Banz Classic Tropical Green sunhat in Baby size (0-2 years), a matching pair of Adventure Banz sunglasses in Lime Green, a sunglasses case, a UV indicator, a tote bag and a 60ml Oasis Sun organic sunscreen. The perfect sun smart babywearing accessories! 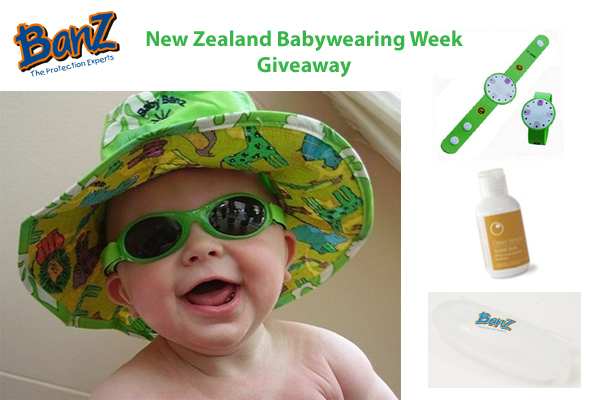 This entry was posted in Giveaways and tagged Baby Banz, baby sunglasses, baby sunhat, international babywearing week, New Zealand Babywearing Week, NZ Babywearing Week, sun smart. Bookmark the permalink.